Cat Foley in action in the 1500m at Brighton. Nene Valley Harriers golden girl Cat Foley has had a week to remember, racing her way to two personal bests in less than 72 hours. The Loughborough geography graduate ran the 3000m at the Charnwood AC open meeting on her former university track last week, and in a high class field shattered her PB with a time of 9:53.93. This made her the first Nene Valley lady to run under 10 minutes for the distance in 20 years. Not being one to rest on her laurels, Foley travelled to Brighton with the Nene Valley track and field team for a crucial Southern League fixture on Saturday and won both the 800m and 1500m races. And her 800m time of 2.19.35 represented another PB, surpassing her previous fastest time which she set in 2007. Earlier in the year the in-form athlete finished 23rd in the national cross-country championships, and came home 12th in the Bourne Woods Frostbite League race, the highest ever placing by a lady in the long history of the series. Despite this busy schedule, she also found time to set a ladies course record of 17.53 in the Peterborough parkrun four weeks ago. Two of Nene Valley’s top distance runners took part in the Grantham Summer Solstice 10k last Friday. 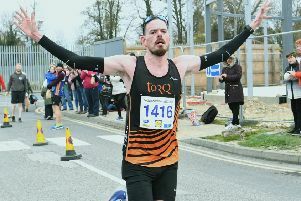 Sean Beard continued his excellent form of late finishing fifth overall and first veteran in a time of 34.44, while Mike Chapman came home in 23rd position in 37.04.